“Embellishing a style introduced by Kenny Clarke a few years earlier, Roach devised a fresh approach to playing his instrument that initially mystified and thoroughly challenged other drummers. 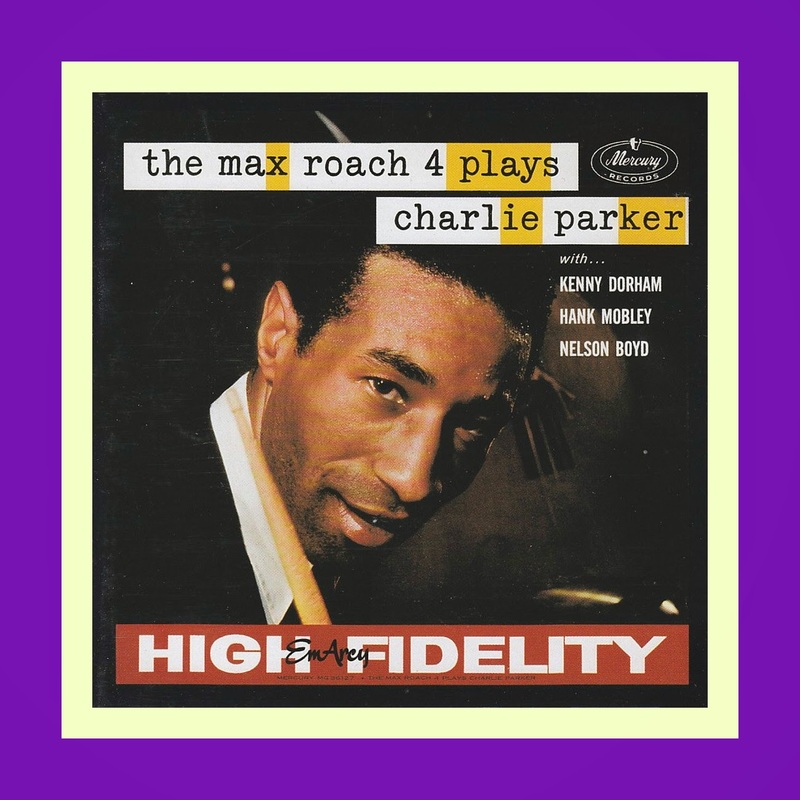 On his first recordings with Parker, he displayed a highly responsive, contrapuntal style. The time was established on the hi-hat or top cymbals, rather than the snare and bass drums. A regular pulse, softly played on the bass drum, provided a foundation (or "bottom") for the music. This was a holdover from the old way of playing. Added to the recipe were comments on accents made on the snare and bass drums, often in close conjunction. In essence, Roach worked with techniques out of the drums' lively tradition, some of them stemming from Jo Jones, some from Sid Catlett, more than a few from Kenny Clarke, and combined them with techniques he invented himself. His performances were highlighted by singular patterns that were used in fills and solos and also appeared in one form or another when he played a purely supportive role. He consistently showed how to effectively use space, silence and dynamics. Roach made a case for the drummer as a musician. Because he practiced incessantly and was a player who performed around the clock, Roach developed admirable technique and coordination. He concentrated on what drummers call independence, playing different rhythms with each appendage, which created new levels of interest for the attentive listener. He began to liberate the drum set in a major way. His talent, razor-sharp mind and inventive approach to music resulted in new applications of drum rudiments and increased use and integration of the bass drum, cymbals and hi-hat. The editorial staff at JazzProfiles is hard at work on an extended piece about drummer Max Roach, who along with Dizzy Gillespie, Charlie Parker, Bud Powell and Charles Mingus, deserves to be recognized as one of the creators of Bebop and the style of music that predominated the post World War II modern Jazz movement. While this feature is in the works, we thought we’d call your attention to the following announcement which appeared in the April 24, 2014 edition of Downbeat Magazine. and to the video tribute to Max that follows it. © -Geoffrey Himes/Downbeat, copyright protected; all rights reserved. 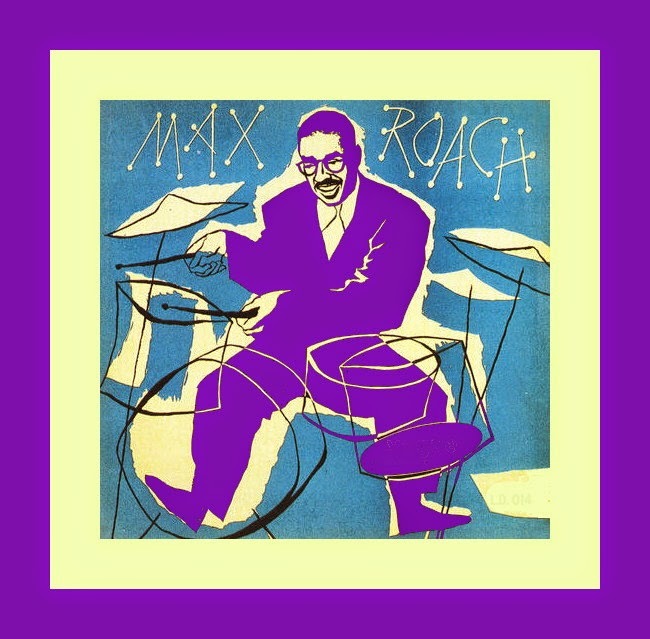 “At a public ceremony in Washington, D.C., on Jan. 27, 2014 the Library of Congress unveiled the Max Roach Legacy Collection, the drummer's personal papers, recordings and memorabilia, which the library had acquired from the Roach family a year earlier. To give a sense of the roughly 100,000 items in the holdings, samples were spread across two tables. At the end of one table were several artifacts related to Roach's landmark 1961 album, We Insist! Max Roach's Freedom Now Suite. The artifacts include the contract with Candid Records, the original, unused album artwork, a program from a live performance and a portion of the score written in Roach's own hand. Roach was a collector. 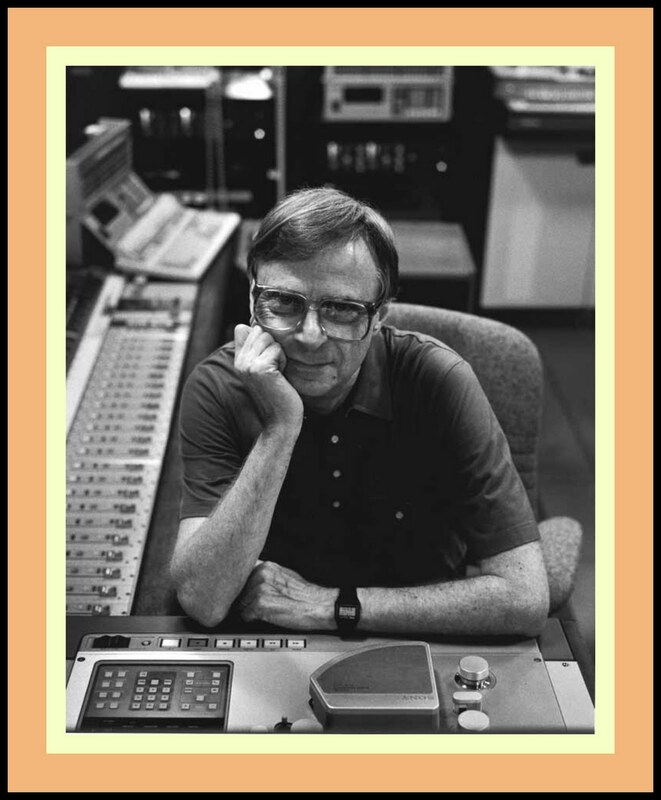 He saved anything that might document his career: contracts, photos, posters, programs, reel-to-reel tapes, rehearsal cassettes, videos, scores, written correspondence, address books, date books, magazines, newspaper clippings and more. The documentation filled the basement cage of his Upper West Side apartment building; it spread out to as many as three self-storage units. One item in the Library of Congress collection that jazz historians will be particularly interested in is the unpublished manuscript for an autobiography that Roach had worked on with writer Amiri Baraka (who died Jan. 9, 2014). "He had a strong sense of his place in history, and he wanted it documented," the drummer's oldest daughter, Maxine Roach, said at the Library of Congress. "In the last years of his life, I asked him, 'What do you want us to do with all the stuff you have in storage?' He said, 'I don't care where it goes, but I want it to stay together.'" Maxine Roach had attended the April 2010 unveiling of the Dexter Gordon Collection at the Library of Congress with Maxine Gordon, Dexter's widow. Roach was so impressed by the experience that she convinced her stepmother and her four siblings to give the Max Roach Collection the same home. "When we were kids, they were just boxes of junk," said Maxine's brother Daryl. "But as I got older, when I spent a summer setting up his drum kit at European festivals, I realized he was more than just my dad. And now, seeing some of the stuff in those boxes, it's like putting the pieces of a puzzle together. I can see the breadth of his associations. I can see that he wanted to be viewed not just as a musician but also in a sociopolitical-economic context. He was a holistic thinker." The Library of Congress plans to create a searchable database of all the artifacts in the collection. If a musician, academic, journalist or blogger wants to research the Freedom Now Suite, for example, he or she can request it and the staff will know which carton contains the related materials. The staff will bring the materials to a table at the library's reading room so that the person doing research can examine them up close. The following video tribute to Max is set to George Coleman’s Shirley from Max Roach + 4 On The Chicago Scene [EmArcy 36132; Mosaic MD7-201]. In addition to George on tenor saxophone and Max on drums, the quintet includes Booker Little on trumpet, Eddie Baker on piano and Bob Cranshaw on bass. Please click on the “X” to close out of the ads. Randy Johnston - "Walk On"
“Lewis Nash? No? Kenny Washington!? [after he was given the information that the tune and the players he was being asked to identify was Magic Beans from Benny Green’s Benny's Crib on Sunnyside, 2013 with Benny on piano, Peter Washington on bass and Kenny Washington on drums]. I can’t think of a higher compliment to pay a drummer than to say that they make the music swing. The editorial staff at JazzProfiles takes great joy in finding music by the current crop of Jazz musicians that’s played in a straight-ahead and swinging manner. 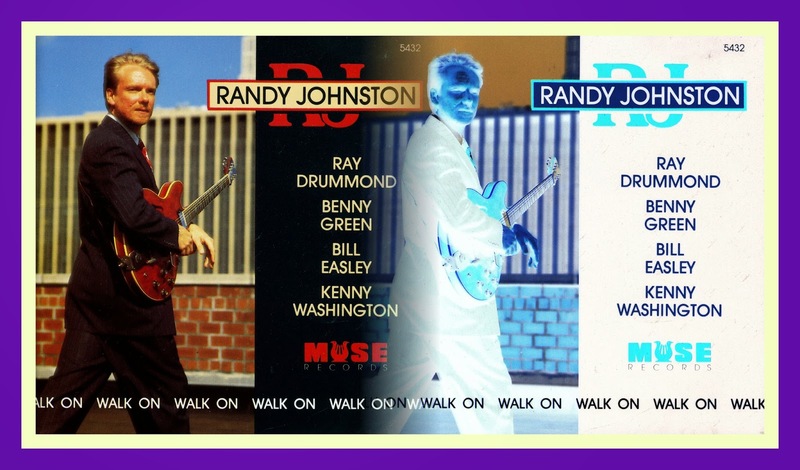 In this regard, Benny Green and Kenny Washington were responsible for my discovery of guitarist Randy Johnson as they along with bassist Ray Drummond formed the rhythm section on Randy’s Walk On Muse CD [MCD-5432]. I didn’t know who Randy was but since Benny and Kenny were on the date, I thought I’d take a punt on this recording. I’m sure glad I did as Randy’s blues-drenched, straight-ahead and swinging guitar style has since become a staple of my Jazz guitarist playlists. Here’s more background on Randy and Walk On from the CD’s insert notes as authored by Bob Porter of WBGO Jazz Radio. “Randy Johnston was working in Harlem at Small's Paradise with singer Delia Griffin when Etta Jones heard him for the first time. While her accompaniment has rarely included guitar (except on records), Etta Jones knows a good musician when she hears one. Within a few months, she and her partner, Houston Person, began dropping Randy's name among those on the lookout for new talent. Randy quickly began showing up on Etta's recordings -then Houston's. Walk On is his first album as a leader. His accompanists are among New York's finest. Kenny Washington was the first player who came to Randy's mind. The versatile young percussionist is a favorite of almost everyone. Kenny, born in Brooklyn (5/29/58), has been a regular member of working groups led by Betty Carter, Kenny Burrell, Tommy Flanagan and, at this writing, Milt Jackson. Randy felt that Washington would be able to handle-with-ease the range of material for this first recording. One quick listen will tell you that the drum chair is in good hands. Bill Easley plays a whole variety of reed instruments and has been active in Broadway show bands as well as studio work around New York. Originally from upstate New York he has worked out of Pittsburgh and Memphis prior to settling in the New York area. His long list of affiliations includes George Benson, Mercer Ellington and Jimmy McGriff. His own albums have appeared on Sunnyside and Milestone. Benny Green seems the natural heir to what Wynton Kelly represented in the 50s and 60s. His lines are clean and cliche free and his style blends easily with much of the music being made today. While his customary working situation finds him at the head of a trio, his work with Art Blakey made certain that his abilities as a band pianist would have the best possible tutelege. 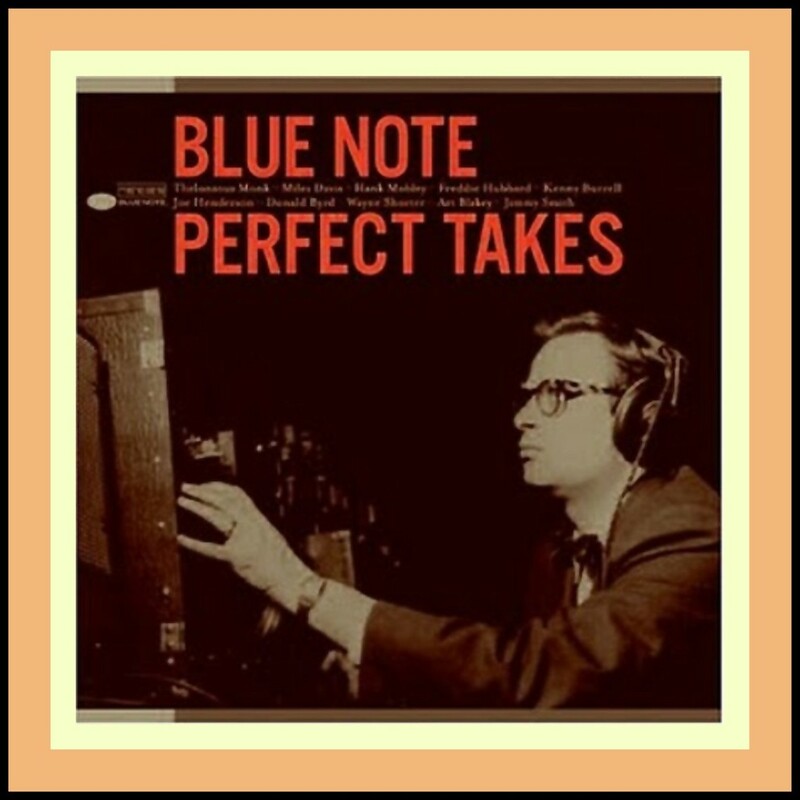 He currently records for Blue Note. Ray Drummond is a major league performer on bass and has been for many years. Raised in the San Francisco bay area he was the bassist of choice for travelling musicians coming to that part of the country prior to his move to the Apple. The material chosen by Randy and producer Houston Person covers a lot of territory. The Jumping Blues is a Kansas City anthem long associated with the composer Jay McShann while Moanin' is the quintessential Jazz Messenger standard (one that Benny Green knows very well). Crazy She Calls Me is a feature for Randy's best ballad playing while his compositions, The Queen's Samba (a dedication to Etta Jones) and the title track, Walk On, demonstrate Randy's abilities as a writer as well as a player. This album is being released in January 1992 at a time when much of the country will be battling chilly, winter weather. The music on this disc will certainly help to keep your soul warm at any time of year. The album title says it all. It is certainly time for thirty-five year old, ex-Detroiter Randy Johnston to take center stage and to Walk On - into the spotlight! I’ve selected the title track to accompany the following video tribute to Randy which includes a collection of images of all of his recordings as well as some photographs of him. The editorial staff at JazzProfiles delights in discovering new writings that provide additional perspectives on the music of some of its favorite artists and sharing excerpts from them with its readers. © -Zachary Woolfe and The New York Times, copyright protected; all rights reserved. “For a long time, big-band jazz relied on a swinging but implacable wall of brass: the sound of Count Basie, Benny Goodman and Duke Ellington. Schneider absorbed what she calls that “frontal load of decibels and power and energy,” and she has never abandoned it completely. But the music she began composing when she moved to New York in the late 1980s took on a different character. After graduate work at the Eastman School of Music in Rochester, she moved to New York and began working as a copyist, churning out instrumental parts from orchestral scores. It was through a copying gig that she met and started working as an assistant to Gil Evans, who was Miles Davis’s arranger of choice in the glory days of Birth of the Cool and Sketches of Spain. Evans was a revelation. He would regularly bring in instruments that weren’t part of the big-band palette — French horns, flutes, oboes — and his writing willfully stretched the abilities of his players. She worked for years to flesh out the orchestral elements in her style of jazz, through her debut, Evanescence (1994), a combination of brassiness and lightness; Allegresse (2000), with its Brazilian accents; and her 2004 masterpiece, Concert in the Garden, whose pieces have the sweep and drama of tone poems. But what she had not done until recently was write for an actual orchestra, with its full complement of strings and its lack of improvisation. It was not long after Concert in the Garden that she met the soprano Dawn Upshaw, who came to prominence singing Mozart at the Metropolitan Opera in the 1980s and emerged as a bold advocate for contemporary music. Upshaw had gotten in the habit of attending Schneider’s band’s annual Thanksgiving-week performances at the Jazz Standard in Manhattan. [Winter Morning Walks would go on to win three Grammys in 2013]. 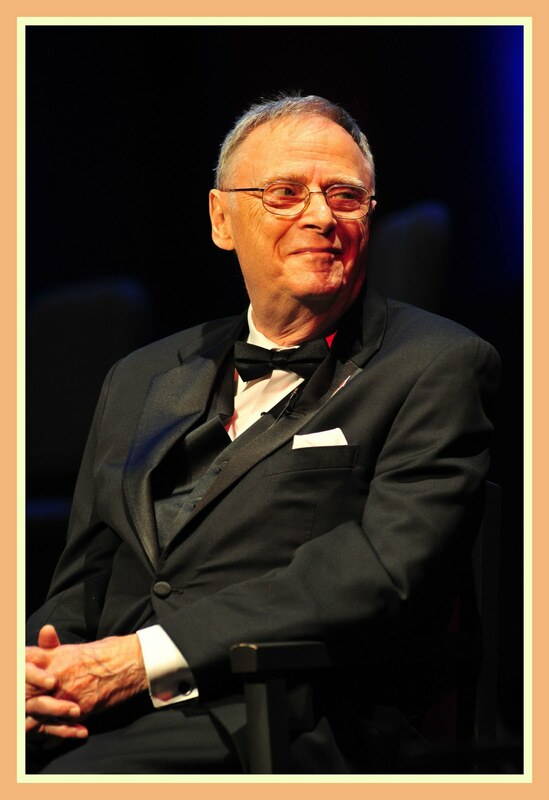 A daring composer defies categories. “A SNUG one-bedroom flat near Manhattan's Central Park serves as home and studio to Maria Schneider, composer and bandleader. Her sister's abstract oils adorn the walls, and pots and pans hang from the ceiling of a tiny kitchen space that could fit in a cupboard. Her prized possession, a 29-year-old Yamaha upright piano, dominates the living room. When Ms Schneider composes, the idea for a new song can come to her in a flash. Or she can struggle for months to weave together a work worth performing. The agony and the eventual ecstasy of Ms Schneider's woodshedding sessions have yielded music that has altered the notion of what a modern jazz band can sound like. When her 19-member Maria Schneider Jazz Orchestra appears at New York's Jazz at Lincoln Centre later this month, the audience can expect to hear works that defy categorisation. One moment, the group can be freewheeling and jazzy. A song or two later, it glides with ease through Ravel- or Chopin-like movements. Then a chamber-music-style duet can seize the spotlight while the rest of the musicians sit in silence. Ms Schneider's daring compositions have helped her to elbow her way onto the list of jazz's finest living composers. In 2012 the influential annual poll of critics in DownBeat, a jazz magazine, bestowed upon Ms Schneider triple-treat status as the genre's best big-band leader, arranger and composer. Those who have knocked on her door requesting commissioned works include the Los Angeles Philharmonic Association and the Danish Radio Orchestra. Among the oddest non-musical requests came from a wine producer in Germany who asked her to select the grapes for a wine that now bears her name - the Reichsrat von Buhl Maria Schneider Jazz Riesling. Ms Schneider stunned the classical music world in January, when her 2013 recording, Winter Morning Walks, won three Grammy Awards, including one for best contemporary classical composition. The project set verse from a collection by Ted Kooser, a former poet laureate in America, to music. The poems, from "Winter Morning Walks: 100 Post Cards to Jim Harrison", document his reflections on life and nature while he was recovering from cancer treatment. field mouse, sparrow each watching from darkness this man with the moon on a leash. Ms Schneider's journey to band leader began in the tiny farm town of Windom, Minnesota. A local music teacher, Evelyn Butler, introduced her to the piano when she was five years old. By the age of eight, she had written her first song. Becoming an instrumentalist, though, did not seem to be in the stars. She tried her hand at the clarinet, and was a "horrible" violin player. She also struggled as a youngster to play trills on the piano. ‘I'm not a performer,’ Ms Schneider says. After studying music at the University of Minnesota and the Eastman School of Music, she decided that band leading and composing were her calling. She moved to New York and became an assistant to Gil Evans, who had arranged music for some of Miles Davis's recordings. At the same time, she was seeking ways to create her own voice and vision for an orchestra. Evanescence (1994) showcases her skill at writing gorgeous melodies for horns and shifting moody harmonies. Ms Schneider also went her own way when she dumped the traditional record labels and signed on with ArtistShare, a New York-based digital-record label that distributes its music only on the internet. A record label usually foots the bill for the recording's cost and takes the lion's share of its profits. Instead, Ms Schneider raises the money from fans in exchange for giving them a behind-the-scenes view of the recording process or a credit as a producer. She made history when a 2004 recording, Concert in the Garden, became the first digital download-only CD to win a Grammy award. Spectacle movies have been a part of all ages and phases of Hollywood film productions. Unfortunately, the music scores written for many of these blockbusters sound as though they should be accompanying Armageddon. Imagine my delight then when I first heard Alex North’s exceptionally beautiful love theme which he composed and orchestrated for the 1960 movie extravaganza, Spartacus. Such delight was even more enhanced when pianist Bill Evans recorded The Love Theme from Spartacus as part of his 1963 Verve LP Conversations with Myself, an album that is particularly noteworthy for Bill’s ingenious use of multi tracking. 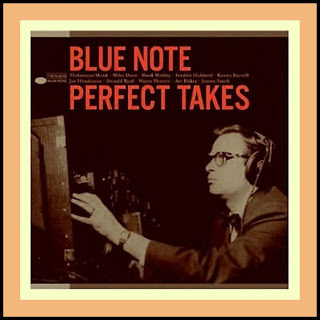 In his definitive biography Bill Evans: How My Heart Sings, Peter Pettinger observes: “A number of the tunes [on Conversations with Myself] started with brief atmospheric introductions, colored by delicate, pointillistic rippling. This was Evans the orchestrator at work, thinking perhaps of the pianissimo flutes, clarinets and harps of Ravel’s Daphnis and Chloe. A good example of this was the ruminatory Love Theme from Spartacus. Forty years later in 2003, similar observations might made about Maria Schneider’s arrangement of North’s compelling and radiant melody which she performed with The Metropole Orchestra Big Band [sans strings] at the Bimhuis in Amsterdam in 2003 and which forms the soundtrack to the following video tribute to Maria and the Metropole Orkest. “Organ-tenor ensembles have been a staple of the Jazz performance legacy for the better part of 40 years. Pipe organs were actually the first organs available to Jazz artists, Pioneering musicians like Thomas “Fats” Waller used pipe organs in churches, as accompaniment to silent films and of course in ensembles featuring secular music. 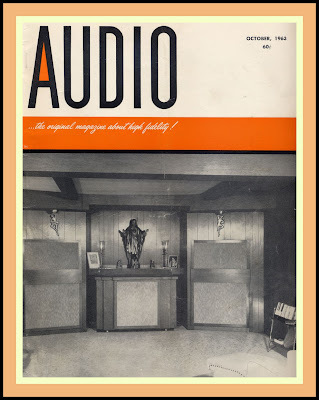 It was the introduction of the first electric organ by Laurens Hammond in 1935 and the subsequent development of a speaker containing two rotating baffles by Don Leslie that jump-started the popular interest in the instrument by players in all genres of music. Of course the most outstanding quality of the Hammond organ was its (relative) portability. Like its predecessor, the theater organ (Developed by Robert Hope-Jones and introduced by the Wurlitzer organization in the early 1900s), there were multiple stops and pedals for the imitation of other instruments and to allow for orchestral voicing of the music. Jimmy Smith is generally credited with having pieced together all of the elements of the technique inherited from the pipe, theater and electric organ traditions of Jazz and the blues and rhythm and blues influences which are the critical factors in creating a sound which is so accessible it often becomes the doorway by which Jazz fans first discover their love for the music. 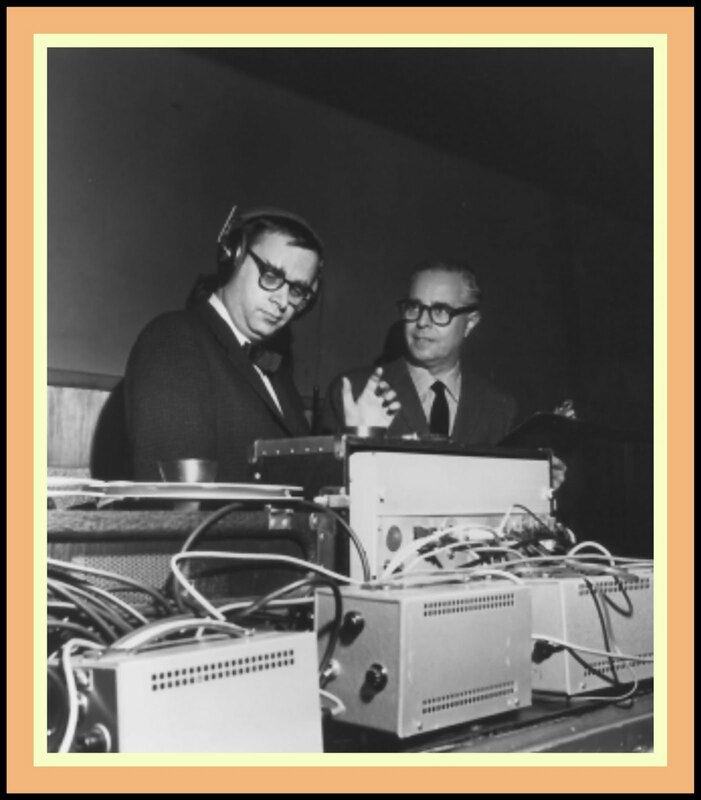 Additionally, we probably have Messrs. Waller, Smith, Bill Basie, Milt Buckner, Wild Bill Davis and a host of others to thank for many of the techniques which are now commonplace for keyboard players who work with synthesizers. Aside from his musical inventiveness and blazing technique, I’ve always felt that other qualities have made Hammond B-3 organist Joey DeFrancesco one of the more admirable members of the current Jazz generation including his amiability, geniality and respect for the Jazz tradition. Jazz has always been about jam sessions or in the parlance of the music - Jammin.’ In the early years of the music, jam sessions were where you learned your craft. You sought out places to jam, sat in and measured yourself against the skills and ideas of other musicians. Jam sessions could be competitive, sometimes brutally so and, in this regard, they could be a test of courage. My initiation into the world of jammin’ involved getting up on the stage with a half dozen or so horn players and playing a blistering uptempo version of All The Things You Are for what seemed like an eternity while each hornman took an extended solo. When it was over, my right hand was shaking so bad from playing a continuous cymbal beat that it couldn’t hold a glass of water. I don’t know how musical it was, but I got it done. I guess I cut it because I was allowed to stay on the bandstand to play the next tune. More often, though, jammin’ is about learning to play with musicians whose style and approach are different if not singular. Experiencing such diversity served to broaden your Jazz vocabulary and helped you learn other ways to express yourself in the music. Cats like baritone saxophonist Gerry Mulligan, drummer Shelly Manne and bassist Milt Hinton played with anyone and everyone. Swing-era saxophonist Coleman Hawkins employed some of the earliest beboppers in his band because he wanted to learn the “new music” from associating with them. Even The King of Swing, clarinetist Benny Goodman, tried his hand at be-bop for awhile and other Swing Era icons like clarinetist Woody Herman, drummer Gene Krupa and trumpeter Harry James led big bands that fit very nicely into the modern era. 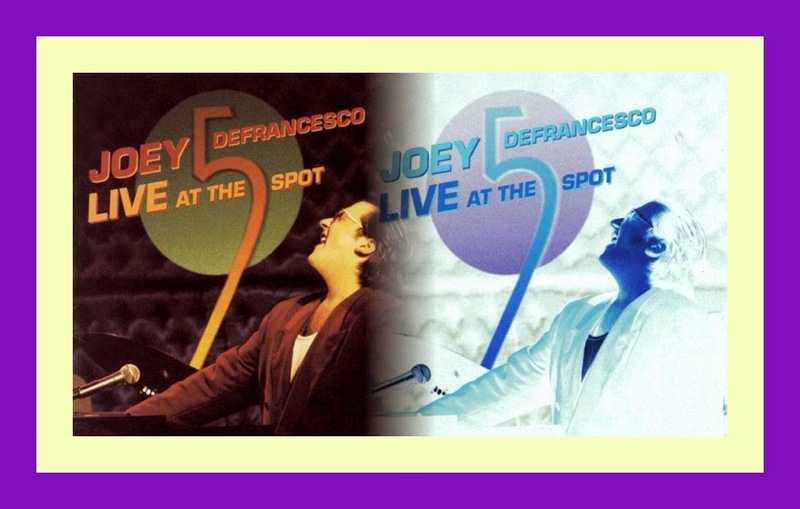 No one on today’s Jazz scene is more into jammin’ with musicians from all eras and styles of Jazz than Joey DeFrancesco. If you have any doubts about this assertion all you need do is check the personnel on the recordings he’s made over the last 15 years or so. Although I didn’t recognize it as a conscious choice on Joey’s part because I had nothing to compare it to at the time, my first awareness of his inclination to such diversity was Joey’s Live at The Five Spot Columbia CD [CK 53805] on which he appeared with a variety of guest stars including tenor saxophonists Illinois Jacquet, Grover Washington, Jr., Kirk Whalum and Houston Person and one of the icons of the Hammond B-3 organ, “Captain” Jack McDuff. Since then, Joey’s been in the recorded company of Jimmy Smith, who more than any other musician is responsible for bringing the Hammond B-3 organ into the modern Jazz era, saxophonists Teddy Edwards, George Coleman, and Gary Bartz, guitarists Larry Coryell, Pat Martino, Ron Eschete, Randy Johnson, Jake Langley and Danny Gatton, and drummers Jimmy Cobb, Billy Hart and Jeff Hamilton. He even formed a super trio with guitarist John McLaughlin and drummer Dennis Chambers and went on a world tour with them - talk about moving your ears in new directions! For many years, Joey’s has primarily been in the company of guitarist Paul Bollenback and drummer Byron Landham, two marvelous musicians who can adapt their styles to work with any horn player. In person, Joey’s admiration for his fellow Jazz musicians is almost palpable - he looks like a kid in a toy store who can’t wait for his turn to make a choice.